What do you mean? Love isn’t a law, surely! Love is a feeling, an emotion that guides your thoughts & your actions, isn’t it? At least that’s how we usually talk about it.. But when Jesus is provocatively asked, ‘What is the most important commandment in the Law?’ he answers, ‘Love the Lord your God with all your heart, soul & mind …. and Love others as much as you love yourself.’ So he describes it, not as something you feel, but as something you’re told to do. An act of the will rather than something you might act on if your emotions direct you to do so, if you feel like it. Not a fashionable idea in our culture – and maybe not any time. Like a lot of ideas that appear in Jesus’ teaching, I’ve written several songs about the central idea of love. Back in 1971 we were listening to an early album of Steeleye Span, and I put new words to 2 of the traditional songs. One was Twa Corbies, a melody I used to retell the story of Jesus walking on the water (All at sea). The other was Copsawholme Fair. This tune carries the words for Love is the Law. with thunder comes lightning, it's always the same. the sun needs no telling that daybreak is here. o how I would like to know what must be done. It's always a struggle between right and wrong. I need you, Lord Jesus, to guide me along. our hearts are the paper and love is the law. 4. "My Spirit I leave you, although I must go, my Spirit I leave you, my peace you will know. Love one another as I have loved you. This I have told you, this you must do." Christ is our brother & Christ is our King. Love is the song he has taught us to sing. Yes, it’s a law, but always we live ‘in Christ’. In this eternal relationship we have freedom – to love, to serve, to care – but we also have the freedom to fail, to slip, to fall. A paradox? Yeah, but that’s life! 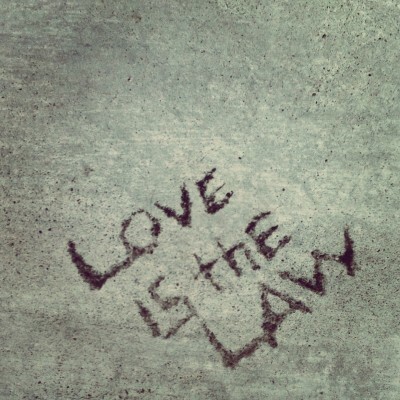 Download the 'Love is the Law' PDF here!